I am from Sindh living in Kotri adjacent city to Hyderabad and I am sure you would be familiar with this famous city of Sindh. It is very nice to see your site. 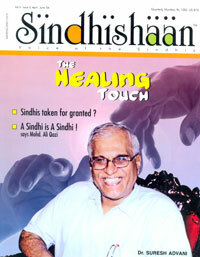 In fact it is the most charming site of Sindhi speaking people. You are doing very well. One thing which I may suggest that since now world has become a small global village, hence, you should not fold it to India, spread it up to all Sindhis living irrespective of religion because the fundamentalists of religion have harmed us more than anything else. Taking opportunity of this I would also request to please let us have some glimpses of the Magazine on the site. Hope you would be planning to make it more and more charming and informative site of Sindhi people living around the world.